Artist Code: 1107. Completed August 2011. Original SOLD. Water colour on Aquarelle Arches 100% hot pressed cotton rag paper. Unframed size 12” x 16”. Framed original 22” x 18”. 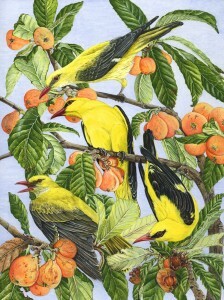 This painting was selected for and sold at the National Exhibition of Wildlife Art (NEWA) 2012. From July 2011 to December 2014 this painting was available as a Whimsy Jigsaw Puzzle by Wentworth Puzzle Company, catalogue no. 592306. This is my second work to be featured as ‘Picture of the Month’ in the Portfolio section of Artists & Illustrators Magazine, October 2011 issue. (Artist Code 1003, ‘Passion Flower Bits’ featured in Portfolio in the March 2010 issue.) In my sister’s garden, Cortijo Del Guarda, Cortijo Grande Valley, Spain in late May 2011, every morning at dawn we were awoken by the distinctive fluting whistle of Golden Orioles. As my husband and I stumbled inelegantly and speedily out of bed, we were lucky to see the birds feasting on the ripe Loquat fruits (Eriobotrya japonica). In between pecking at the fruit they were chasing each other about—obviously prenuptials. We were so lucky that a flock of Orioles stopped off in the valley. The first day of our holiday, we saw 8 birds. By the end of the week there was only a solitary male, so this was ‘right place, right time’! The best place to see Orioles in the UK is Lakenheath Nature Reserve (East Anglia), which I visited once and heard one calling, but never caught a glimpse. Even though they are this beautiful rich yellow, they are extremely difficult to spot amongst the foliage. But what beautiful birds; and loquats make a fine jam! In May 2013 we revisited the house and this time watched a pair of Golden Orioles building their nest in a Eucalyptus tree during the week we were there. I actually captured on film their mating ritual which was most exciting and very noisy. I saw whilst sitting, drinking beer!